Would You Pay Double to Live in a Waterfront Home? ShutterstockLaguna Beach, California, tops the list of places with the highest property values for waterfront home. Millions of Americans dream of one day owning a home on the water, and for good reason: The views are often to die for, the array of activities is seemingly endless and the peace of mind gained by knowing you'll never have a neighbor on at least one side of your home is priceless. But the very things that make waterfront living so appealing can also make it incredibly expensive. Nationwide, the typical oceanfront or lakefront single-family home is worth more than double the median value of all homes, and in some communities the median waterfront home could be worth more than 10 times the median value of non-waterfront houses, according to a new analysis by Zillow. The median single-family home in the U.S. is worth about $171,600, while the median waterfront house%VIRTUAL-pullquote-Potential buyers looking for the lowest entry point into the waterfront market should consider the lesser-known cities of the Sunshine State.% is valued at $370,900, a waterfront premium of 116.1 percent. Zillow analyzed the 250 largest communities with at least 100 waterfront homes. The analysis only considered oceanfront homes or those on a lake larger than 10 square kilometers. Homes also had to be within 150 feet of the waterline to be considered waterfront. Riverfront and water-view homes were not considered. Overall, the most expensive waterfront homes are found in communities in coastal California. 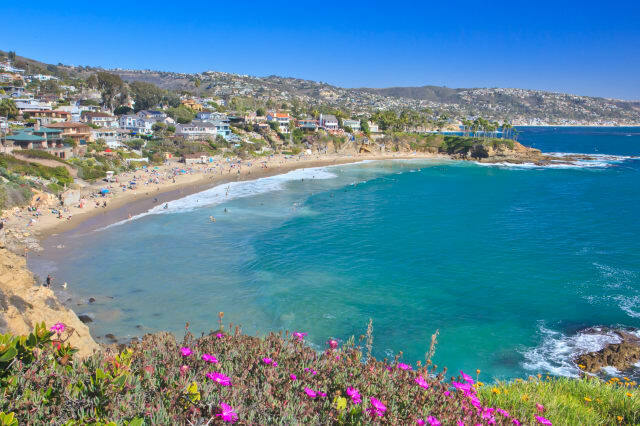 Laguna Beach tops this list with median waterfront home values of almost $10.1 million. Malibu ($6.3 million) and Hermosa Beach ($4.8 million) round out the top three. 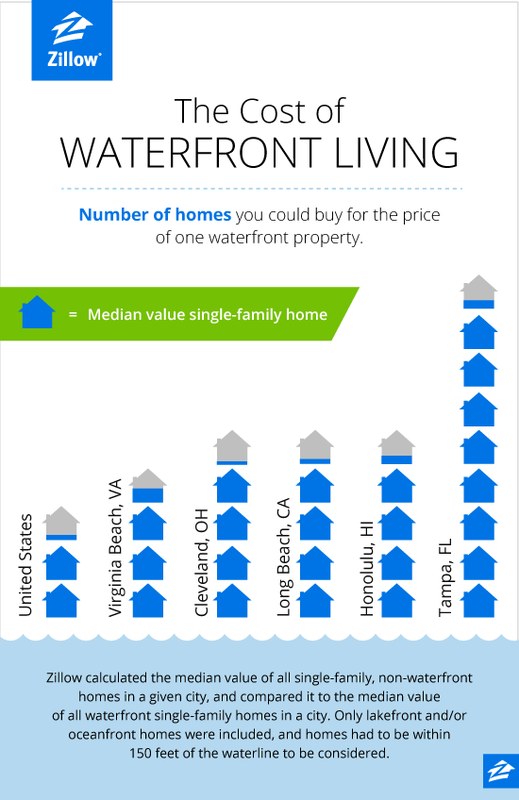 The most affordable waterfront homes in the country are found in Holiday, Florida, with median waterfront home values of $103,000. In the top 10 least valuable waterfront communities, eight of the remaining nine cities with the cheapest waterfront homes are located in Florida. In other words, potential buyers looking for the lowest entry point into the waterfront market should consider the lesser-known cities of the Sunshine State. Among the largest of the 250 cities analyzed (those with populations of 100,000 or greater), the biggest difference between median non-waterfront single-family home values and median waterfront house values are in Tampa (waterfront premium of 733 percent), Honolulu (waterfront premium of 334.5 percent) and Long Beach, California (waterfront premium of 321.6 percent). "The allure of ocean and lakefront living is powerful and undeniable, and millions of homeowners nationwide dream of one day owning a home on the water. But those dreams come at a price," said Zillow Chief Economist Dr. Stan Humphries. "Waterfront properties are both relatively scarce and highly coveted, and that high demand and limited supply leads to higher home prices. Additionally, added insurance, floods, environmental mitigation and infrastructure costs are often part of the tab when buying a waterfront home. Still, as long as buyers understand the added costs and potential headaches, waterfront living is likely to remain one of life's simple pleasures for many, many years to come." Information on all 250 cities analyzed can be found on Zillow Research here.